I purchased a very expensive strand of thundereggs to get this one bead. I've used a few of the others (e.g., in the Painted Pony Necklace) because every thunderegg is beautiful, but this one is spectacular. Thundereggs form as rough spheres in a volcanic flow of rhyolite. 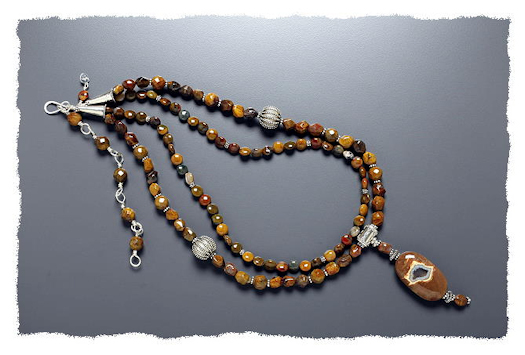 The center is usually chalcedony in the form of agate, jasper or opal. The interior is often roughly star-shaped when seen in cross section giving the impression that geodes of rhyolite must have formed then been filled in with chalcedony. The thunderegg is Oregon's "state rock" though they occur all over the world. Legend has it that when the thunder beings of Mt Hood and Mt Jefferson got angry at one another, they would hurl thundereggs. 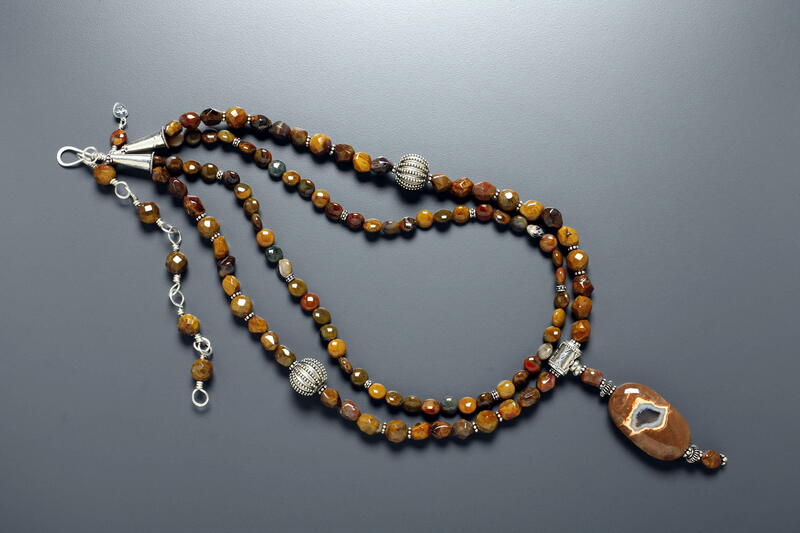 The petrified wood beads matched the rhyolite coating of the thunderegg nicely. Petrified wood develops as the dead wood is replaced by silicon dioxide. The slow transformation preserves much of the original form of the wood including growth rings, bark and worm holes. As you'd expect, petrified wood is associated with the earth element and is a stone of slow, steady growth. Because the trees lived 100-200 million years ago, Simmons notes that petrified wood can be used to view the Akashic records of this planet. Please order this beautiful necklace and embark on your own journey of exploration with these stones attuned to the deep past.